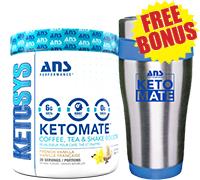 Ketomate™ is a versatile zero sugar creamer designed to give your favorite beverage an incredible flavor experience, while also boosting mental energy and performance. It’s the perfect way to indulge in a tasty and healthy treat while following a low-carb or ketogenic diet. L-Tyrosine can provide cognitive enhancement, mood and motivation improvement, while also mitigating the effects of stress on the mind. L-Tyrosine is also a precursor of the important neurotransmitter dopamine. Dopamine can be converted into other catecholamines, such as norepinephrine and epinephrine. MagicLION™ is a specialized extract of Lion’s Mane mushroom. This uniquely powerful fungi is being studied for it’s neuro-regenerative properties – it promotes the maintenance and regeneration of nerve cells. L-Theanine is a naturally occurring amino acid found in black or green tea. L-theanine has been shown in human studies to moderately improve alertness and attention while also reducing symptoms of anxiety. It is a great synergy with caffeine – so it’s the perfect addition to a coffee or tea beverage which can have naturally occurring caffeine content. 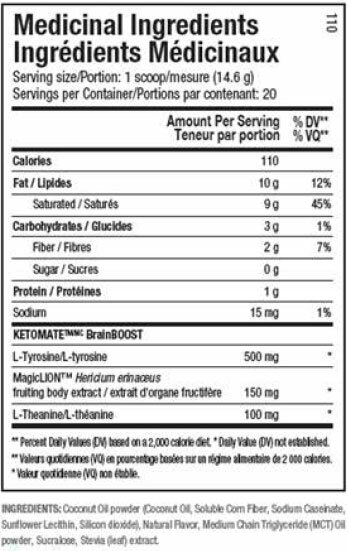 Add a little or add a lot, 1 scoop of KETOMATE™ transforms your coffee into a flavorful ‘double-double’ with zero sugar and 10g of healthy fats coming naturally from coconut oil and MCTs.